Original Crown Mill paper actually dates back as far as 1478 when the Holy Roman Emperor of the time, Emperor Maximilian I, granted the monks of the Belgian hamlet La Hulpe permission to build a mill on Grand Etang (Big Pond). They did, and bolstered by their close proximity to Brussels and the clear, pure waters of the 'silver river' L'Argentine, they thrived. The monastery quickly became a hub of fine paper-making, earning the Crown's ultimate seal of approval when King Philip IV of Spain invested La Hulpe with the title "Imperial and Royal Paper Manufacture" in 1664. Another two centuries later, Belgium's Industrial Revolution hit. Enter Frederic Pelletier who, in 1870, set out to preserve and continue the 17th handmade paper style. 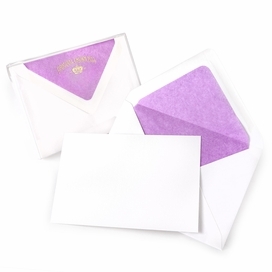 Since then, the venerable Pelletier Company has produced this crisp laid finish paper to exacting standards of elegance, supplying the Belgian Royal Family and the rest of us with beautiful, evocative stationery. You'll find that Original Crown Mill paper is fountain pen friendly and perfect for pen pals and special occasions alike.